Belle And Sebastian: On 'Love' And Faith The indie-pop band from Glasgow has seen its audience and influence grow since its 1996 debut. The group's eighth studio album, Write About Love, tackles religious themes more overtly than ever before. Stuart Murdoch, the group's leader, says writing about his faith feels natural for him, but that he's quick to draw the line between his music and Christian rock. 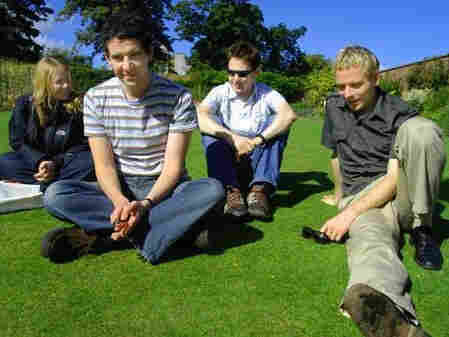 Belle and Sebastian, the indie-pop band from Glasgow, has seen its audience and influence grow since its 1996 debut. The group's last album, The Life Pursuit, was Belle and Sebastian's most commercially successful record to date. Four years later, the band has a new album, Write About Love. Stuart Murdoch is the leader of Belle and Sebastian. Although his songwriting has always tackled religious themes, Write About Love does so more overtly. Murdoch says that writing about faith comes to him naturally. "If you have a thing in your life which is quite obviously the biggest thing that's happening, you can't stop thinking about it," he tells NPR's Steve Inskeep. "You really shouldn't stop talking about it. I want to talk about the things that I'm feeling, and if I have a force working inside of me, and it's something I think about on an hourly basis, then that's what I'm going to write about." Faith took on a different appearance in Belle and Sebastian's earlier work. For example, in "If You're Feeling Sinister," from the 1996 album of the same name, Murdoch wrote from a more cynical perspective. "I was writing from the perspective of someone who was trying to work things out," he says. "And I was kind of mopping up some of the attitudes I had encountered over the previous five or six years. I was a young and fairly hip 19- or 20-year-old punk ... knocking about Glasgow, but I went to church. And this was quite an unusual thing. I didn't see any other hipsters or punks at church." Now, Murdoch tends to write from his own point of view, plainly referencing God and his own Christian faith. "The Ghost of Rockschool" features these words: "I've seen God in the sun, I've seen God in the street / God before bed and the promise of sleep." "It's always tricky, that line between pop music and so-called Christian rock," he says. "I'm not a fan of Christian rock, and I hope that ["The Ghost of Rockschool"] doesn't sound too much like a mawkish Christian rock song." Murdoch's songwriting is instinctive. He says the best songs are often the product of sudden inspiration rather than tedious editing. "The good ones just come out, and it's very straightforward," Murdoch says. "Sometimes, when you have to struggle a bit harder and edit 10 verses into four, the outcome isn't so satisfying." Murdoch says that writing songs has become harder for him as he grows older, conceding that "pop music is a young person's game." He says that when the time comes for him to bow out of music, he'd like to pursue writing of a different kind. "I'd like to embrace the longer forms of writing," he says, "and perhaps move quite happily away from pop music in a kind of dignified way. Because the moment I realize my pop songs aren't as good as the ones kids are writing, I'll quite happily leave it aside."